What is Inventory Control and Inventory Management? In this article, you will find more information about common terms and best practices. According to the same author, inventory control is the function and it's also known as Inventory Management or Stock Control. When we assemble all cost data, we can now proceed to the next step. What is the Economic Order Quantity (EOQ Model)? "Order Quantity= Square Root of (2DS/H)"
In this case, D = Annual Demand, S = Setup Cost or Ordering Cost, H = Carrying Cost or Holding Cost. However, notation can be different from one book to the other but they follow the same logic. As you can see, Unit Fill Rate is the easiest metric because you can ship whatever you have in stock. 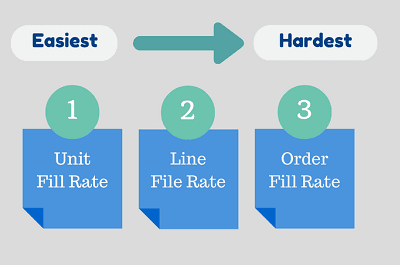 Order Fill Rate is the hardest metric because you have to ship every item in the same order at the same time. Then you have to be more specific which service level or fill rate metric you are talking about. What is the Best Forecasting Model? Most operations management books tell people to choose a forecasting model that produces the lowest forecast errors. Then, many people think sophisticated forecasting models will do a better job. Believe it or not, many fancy forecasting methods have not been tested extensively in the real-world situations. 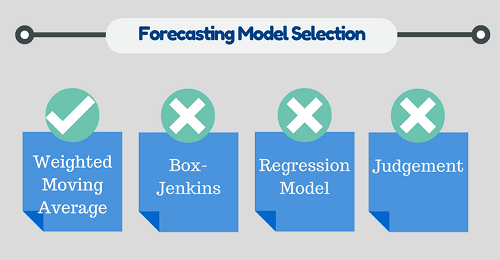 For example, Box-Jenkins model was recently outperformed by a simple forecasting method. Another thing to consider is that a sophisticated forecasting model only provides the excuse for a forecaster when the forecast goes wrong. So sticking to simple methods always yield better results. How to Reduce Forecast Error? - Forecast at the right level: Standard inventory control textbooks suggested that forecast is done at a product family level. The reason is that the aggregation of items help to improve the forecast accuracy (it's referred to as the "Law of Large Number or Risk Pooling). - Combine multiple methods: Sometimes you have multiple sources of forecast data (your own forecast from historical data, forecast adjusted by the sales team, forecast from a customer) what you should do in this case? Some scientific paper suggested you average the forecast from multiple methods/experts because it can lead to improved forecasting accuracy. - Handle unstable time series: In case a time series is very unstable, reducing the weight of smoothing constant of the most recent period (damp trend forecast) will help to reduce the errors because data from the most recent period may not be very reliable. 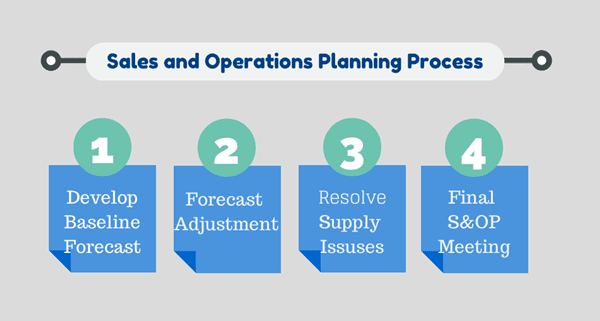 What is Sales and Operations Planning (S&OP)? As you can see, S&OP enables an inventory planner to incorporate various factors that enhance the efficiency of "classic" inventory control theories. 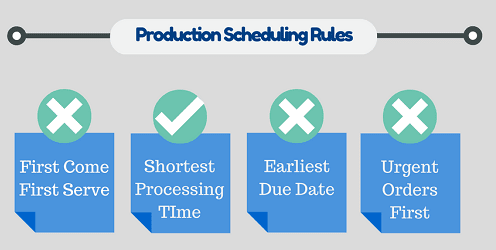 In the manufacturing environment, production scheduling has a very strong impact on the overall service level and level of work-in-process inventory. For many decades, researchers try to improve the efficiency in this area. Many scientific papers confirm that scheduling jobs with the shortest processing time (SPT) first help to reduce overall lead-time. In literal meaning, when the sales team enter the orders consisting of multiple items, producing items that can be finished quickly will increase the overall level of on-time delivery to customers. What is the Storage Policy? Since the variability of order cycle time is high in some situations, reducing cycle time inside the warehouse is strategically important. Improvement in this area can be done through a proper use of storage policy. - Random Storage: the first policy is to store items anywhere. Under this policy, space can be fully utilized but inventory accuracy will be poor because it's difficult to maintain the record of storage locations. Imagine an inventory controller reserves the items but warehouse workers can't find where they are. - Dedicated Storage: second storage policy is more common where items must be stored in designated shelf/bin. This kind of storage policy helps a lot with cycle counting and inventory accuracy. However, order picking time is usually poor because order picker must travel through the aisles which results in longer traveling distance and traveling time. - Class-Based Storage: in the last type of storage policy, high turnover items are stored near the front part of the storage area. The good point is that workers don't have to walk very far to pick the orders. It also helps with inventory accuracy and cycle counting because important items are stored in fixed locations at the front. 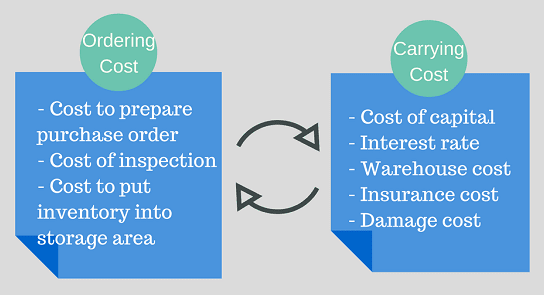 The most important point is to use the appropriate inventory control policy for your business. - Waters, D. (2008). Inventory control and management. John Wiley & Sons. - Russell, R. S., & Taylor-Iii, B. W. (2008). Operations management along the supply chain. John Wiley & Sons. - Hill, A. V. (2007). The encyclopedia of operations management. Eden Prairie, MN: Clamshell Beach Press. - Petersen, C. G., Aase, G. R., & Heiser, D. R. (2004). Improving order-picking performance through the implementation of class-based storage. International Journal of Physical Distribution & Logistics Management, 34(7), 534-544.